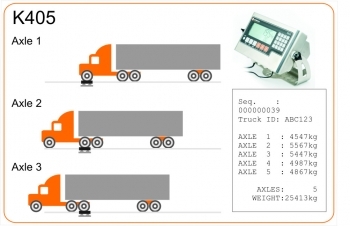 Truck Weighing - Axle Weighing | Weighing ApplicationsZF Associates Co. The R400 series has a specific static axle weighing firmware K405 that is based on the standard truck weighing firmware K404 but allows for each axle weight to be printed on no motion and tallied. K405 allows for a range of operational scenarios all in one setup, from weigh-in/weigh-out to stored truck ids. The alpha-numeric keypad allows for easy entry of tare weight and Truck IDs. With 250 Truck IDs available it is suitable for applications with truck fleets of up to 250.